Dr. B R Ambedkar Medical College (BRAMC) was established in the year of 1981. It is run by Anandaa Social and Educational trust. The college has a 25 acre campus at Kadugondanahalli, Bangalore. It has impressive buildings with unique architectural style which attracts the attention of any visitor. It has a 600 bed hospital inside the campus. 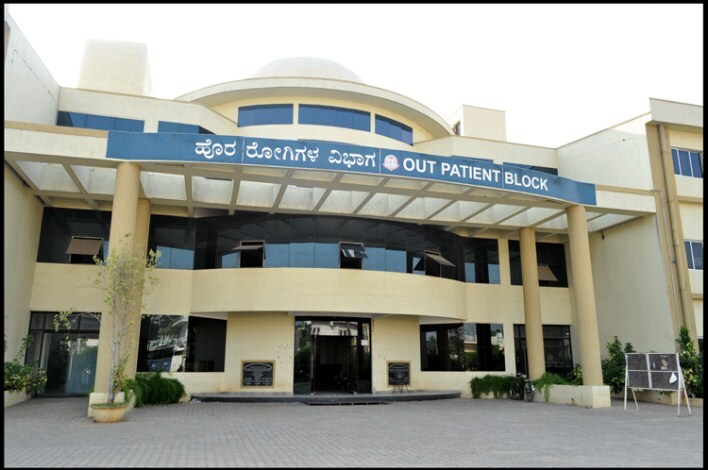 This medical college in Bangalore offers different undergraduate, postgraduate and diploma courses. The courses are approved by Medical Council of India. The college is affiliated to Rajiv Gandhi University of Health Sciences. The college is committed to create excellent medical practioners who are dedicated to their profession and empathetic to the humanity. Its aim is to serve the humanity. The college tries to provide a physically and mentally encouraging work atmosphere for students and faculty. It is committed to provide low cost medical facility and study opportunities for the lower caste sections of the society. It’s most important vision is to do a positive contribution for the improvement of SC and ST people by opening a new thoroughfare for them that will help them to find better position in the social hierarchy. BRAMC provides excellent infrastructural facilities for the students. It has well equipped modern class rooms, laboratory, library, hospital, hostel and mess facilities. The central library has two blocks with more than 16500 books. The B block of library is open 24 hours a day on all the days throughout the year. The library has digital facilities too. It has audio-visual aids, Micro Film Reader, and internet facility. The library supports MEDLINE and Proquest Medical e- databases. Through WEB OPAC the library is connected to HELINET consortium provided by RGUHS. Thus students and faculty get access to full text online journal and E books data bases. More than 100 Indian and Foreign medical journals are subscribed by the library. The library offers other services like photocopying, laser printing, scanning, book bank etc. Other than the central library each department has its own departmental library facility for the staff and PG students. The college aims at the overall development of the students. It has special wings for sports and cultural activities. There is a physical education trainer, a spacious ground and all equipment for outdoor and indoor games. For promoting cultural activities the college has The College Day, Graduation Day and competitions on Karnataka Rajyothsava day. The college also brings forth a college magazine every year to encourage the literary talents of the students and faculty members. The college runs separate hostels for men and women inside the campus itself. The hostels have spacious rooms, lounges, recreation room, color television sets etc. It provides all amenities for a comfortable stay and study. The women’s hostel premises are properly fenced with enough security guards to ensure the safety and security of women students. Mess is attached to the hostels to provide healthy and hygienic food. There is also transport facility by college bus for students at nominal rate in and around Bangalore. The college has a good cafeteria, wireless internet facility and ATM counter inside the campus. The post graduate dissertation/thesis works are monitored by the scientific society of the college. They are presented in monthly scientific meetings and are published in national and international journals. Candidate should have completed 17 years of age on or before 31st December of the year of admission. Candidates of minority status should have Tulu speaking certificate from appropriate authorities. Candidates from outside Karnataka State must get eligibility certificate from Rajiv Gandhi University of Health Sciences.